Seems like every time I turn around, I see a Labradoodle or Goldendoodle prancing down the street or walking into the veterinary clinic. The two hybrids — one a cross between a Labrador Retriever and a Poodle, the other a cross between a Golden Retriever and a Poodle — are among the most popular of the many “designer dogs” created with the goal of reducing allergic responses to dogs or simply to provide a dog who’s just a little different from all the others. I’ve also heard of Aussiedoodles (Australian Shepherd and Poodle), Borderdoodles (Border Collie and Poodle) and CaDoodles (Collie and Poodle). No doubt there are other similar crosses. The search for a unique (and nonshedding) dog is neverending. People who live with Doodles think they’re, well, dandy. Generally fun-loving and frou frou, the dogs have a reputation for being the perfect family pet. 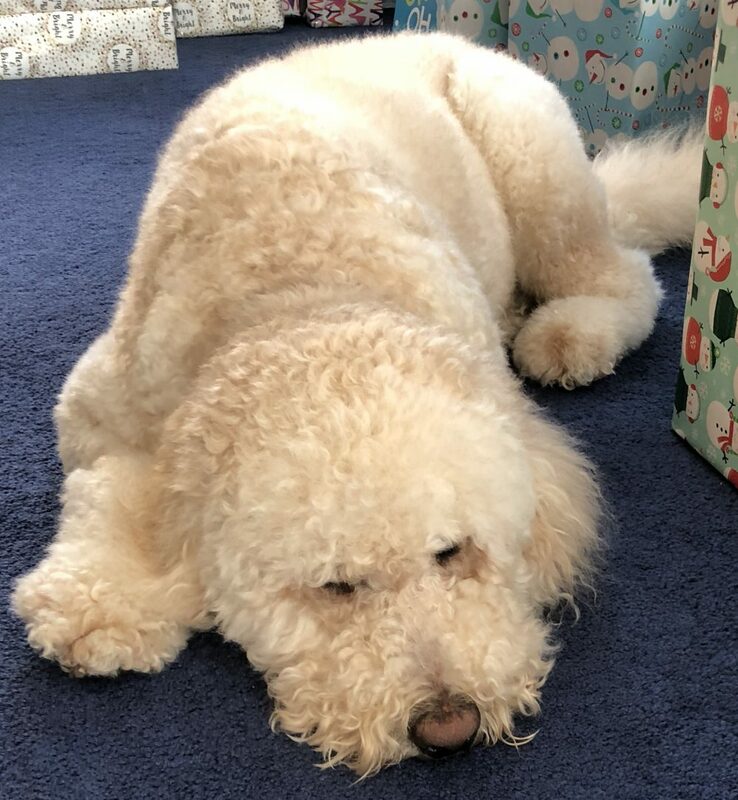 We all know that such a dog doesn’t exist since every family and every dog is different, but certainly the Doodles can make a claim for inclusion in the “great family dog” category. Here are some interesting facts about them that can help you decide if a Doodle is the right dog for you. The Labradoodle is the original Doodle dog. He was created in Australia by a veterinarian who wanted to provide an assistance dog for people with allergies. The “hypoallergenic” claim and the cute name sent the dogs’ popularity into orbit. Labradoodles come in several different colors, including black, white, apricot, chocolate, cream and particolor (a color plus white). But don’t be fooled: Doodles do shed (although some may drop less hair than other dogs), and they aren’t truly hypoallergenic. Fact is, there’s no such thing as a hypoallergenic dog (or cat). Allergens are carried in dander (dead skin cells), saliva and urine, so they’re impossible to escape. It is true that some dogs produce fewer allergens than others, but you can’t assume that Doodle dogs across the board won’t set off allergies if you or a family member suffers from them. Spend some time with several of them before getting one. Depending on the cross, a Doodle’s coat can be wavy, long and silky; slightly wavy and wispy; or tightly curled with a woolly look and feel. Some Doodles have fur that’s a blend of all three types. Goldendoodles tend to have longer, wavier coats than Labradoodles. These dogs can be high-maintenance. To keep him looking his best, brush a Goldendoodle’s coat at least every other day and schedule a trip to a professional groomer for a trim every 8 to 12 weeks — or learn to wield the clippers yourself. And some thick, heavy Doodle coats can take up to two hours to blow dry after a bath. Doodles can vary greatly in size. I know of one couple who expected that their dog would weigh about 35 pounds. He’s close to 100 pounds. Be sure to meet the parents and some of their offspring if you want to have a better idea of how big your Doodle may grow to be. Doodle dogs are mud magnets: They have furry feet and some of them like to dig. Be ready to wipe down your Doodle’s paws and face before you let him back in the house after playing outdoors. Borderdoodle, Cadoodle or Aussiedoodle — the products of a cross between breeds often considered to be genius-level canines — may have the potential to be super smart. They certainly tend to be super energetic. Before you get one, ask yourself if you are prepared to live with a dog who can run circles around you — physically and mentally. Doodles generally like to be where people are. Their activity level ranges from laid-back to active. They are good watchdogs but don’t count on them to be aggressive toward burglars — they’re typically more likely to show an intruder around and then suggest a game of fetch. Individual Doodles have been described as slightly lazy, goofy, mildly stubborn, easy to train and eager to please. With so many different crosses, it’s important to know the personality types of both parent breeds so you can have some idea of what you might expect from your pup. Depending on the breeds crossed, Doodles may live up to 12 or 15 years, which is a pretty good lifespan for a dog on the medium to large side, but they can be prone to the same health problems as purebred dogs. Some may develop hip dysplasia, heart disease, genetic eye problems and gastric torsion (bloat). Buy your Doodle from a breeder who tests both parents for genetic issues common in their respective breeds before producing a litter. You should be able to find test results — positive and negative — through canine health registries such as Orthopedic Foundation for Animals and Canine Health Information Center. The most important thing to know about Doodle breeds is that they can be a bit of a genetic wild card. With designer dogs, you never know exactly which personality traits or physical characteristics will come to the forefront. It’s important to adjust your expectations accordingly if you decide to go with a Doodle dog.